Wall hasn’t looked exactly right for much of this season, so far. His shooting and finishing have been off, but he’s gone through stretches of hilarious inefficiency before. Here and there it’s seemed like he’s less interested in pushing the ball ahead in transition, in his signature one-on-three fast break attack. He hasn’t always seemed to have the lift and explosion of years past when he gets inside. But mostly he hasn’t looked right because his shoulder has been encased in black tape, and he’s been doing an awful lot of grimacing as he’s played through shoulder and knee pain. There was talk a week ago that fluid he’d been given intravenously to treat flu-like symptoms had settled weirdly in his left, surgically repaired knee, and was causing him discomfort. He missed a couple games, both against Toronto, to heal up, and the knee was drained. He played one of his best offensive game of the season in Washington’s last game, a loss to the Hornets Wednesday night in which he went for 31 points and 11 assists against just one turnover. I, for one, mistakenly thought the knee was no longer an issue. It’s an issue! Wall’s absence will pose an extreme challenge, both for Washington’s bench and for my brittle cold-weather psychology. Bradley Beal and Otto Porter are having fine seasons, but Washington’s backup point guard spot is cursed, and Tim Frazier has responded to the curse by looking, on most nights, like a non-NBA player, much like Trey Burke and Brandon Jennings before him. Behind Frazier is Tomas Satoransky, a handsome lad who brings almost nothing to the table offensively, because he can neither shoot nor dribble like an NBA guard. 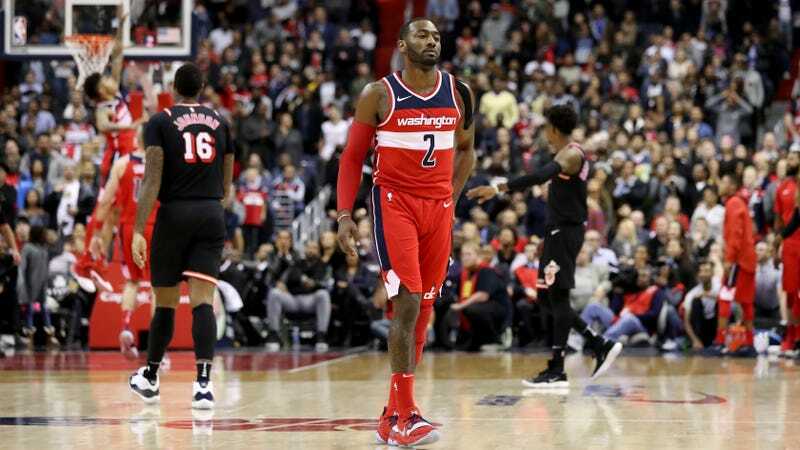 Wall will reportedly be out for at least two weeks—two weeks of watching these bozos fill his minutes might be more than my ticker can stand. The Wizards are entering their toughest stretch of the season, so far: they’ve got the Trail Blazers Saturday night, followed by the Timberwolves, Sixers, and Pistons, followed by a five-game road trip starting December 4. There’s a very good chance all of my hair will have fallen out by the time Wall returns. This blows.